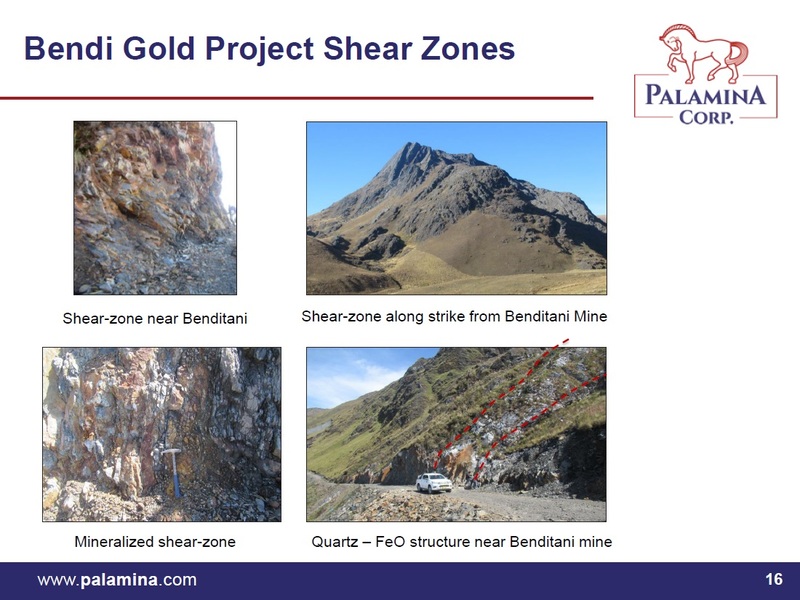 Palamina has secured five gold projects in southeastern Peru in the Puno Orogenic gold belt (POGB). Palamina's Peruvian-based exploration team has a cumulative 35 years of experience in the POGB. The POGB is one of the world's least formally explored orogenic gold belts. 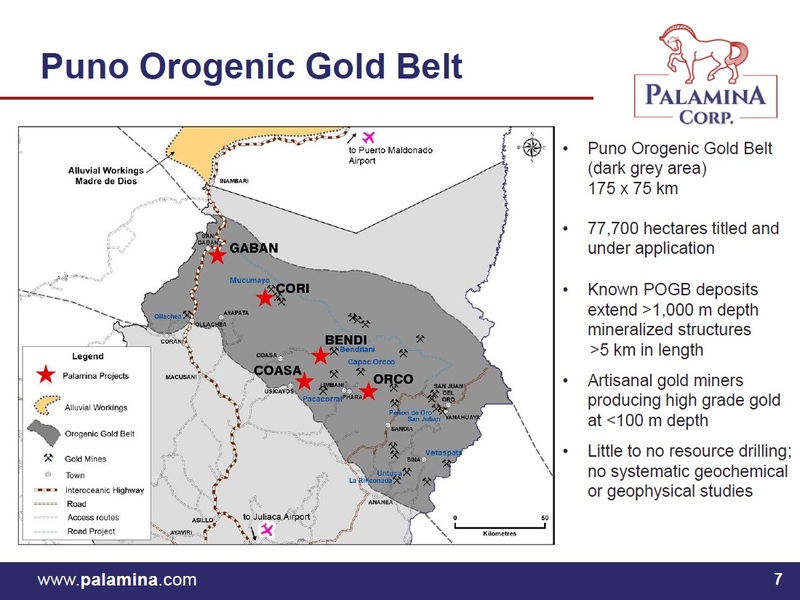 Palamina's five district-scale gold projects now cover 78,200 hectares in the POGB. All have previously been to some extent ground truthed by artisanal, small-scale and informal miners who are generally limited to mining gold from the top 50 to 100 metres below surface. Mineralized orogenic systems can extend down dip to over 1,000 metres in depth. Palamina continues to drive shareholder value through discovery. To date a total of 9 orogenic gold anomalous targets areas have been identified at Coasa. Palamina´s latest sampling campaign focused on gaining an understanding of the potential of the highest priority Phusca and Veta anomalies. At the Phusca target, located some 5 km southeast of Veta, anomalous gold values and strong pathfinder geochemistry results have been obtained from prospecting activities. The open-ended Phusca anomaly extends over some 2 kilometres of strike and hosts several geological features characteristic of individual orogenic gold deposits located in the gold belt. Palamina has discovered a new open-ended 400 by 300 metre-wide orogenic gold zone in the Veta target area. Individual grab samples reached a high of 39.2 g/t gold with a 7 metre long chip sample returning a grade of 4.2 g/t gold. Palamina has commenced environmental and drill permitting in anticipation of a potential drill program on the Veta target. Structurally prepared 10m wide shear zone hosting deformed quartz veinlets containing anomalous gold up to 0.26 g/t. Palamina is seeking partner to advance its Mexican property. Mr. Thomson is the former President and Chief Executive Officer of Soltoro Ltd. which defined a significant silver resource on the El Rayo silver project in South Western Mexico. Soltoro was subsequently acquired by Agnico Eagle Mines in June of 2015. Mr. Thomson is an Entrepreneur who has actively been exploring in Latin America since 1993. Mr. Thomson is fluent in French and proficient in Spanish and currently holds positions on the Board of Directors of Gossan Resources Ltd. and Montero Mining and Exploration Ltd.
Mr. Jennings has over 20 years of financial experience. Mr. Jennings has 10 years of experience as a CFO or member of the Board of Directors of several public companies in the resource, internet technology, manufacturing and aerospace industries. He has significant experience specializing in corporate restructuring with Ernst & Young. Mr. Iver is a South African geologist with 30 years experience as production and exploration geologist in Southern Africa and the Americas. Mr. Iver depth of experience is in managing teams, budgets and logistical issues in addition to significant exposure to the management of community relationships in Latin America. Mr. Iver was the V.P. Exploration for Minera I.R.L. in Peru. Mr. Valdivieso is a Peruvian geologist with 30 years of experience in the Peruvian and South American mining and exploration industry. Mr. Valdivieso has 10 years’ experience in orogenic gold deposits. Mr. Agro is a Principal of Carbon Arc Capital Investments Inc., a private equity backed mining investment firm. Prior to co-founding Carbon Arc, Mr. Agro was Executive Vice President, Strategic Development with Kinross Gold Corporation. At Kinross, Mr. Agro was a member of the Executive Leadership Team and responsible for strategic and operational leadership of Kinross’ growth initiatives including corporate development, global exploration and commercial activities in Russia. Previously, Mr. Agro held senior executive positions with Placer Dome, Senator Capital Partners and in investment banking with Deutsche Bank’s Global Metals and Mining Group. Mr. Waddell is a geologist with over 20 years of diverse resource industry experience, including senior roles with both junior and senior mining companies providing a broad vision of many aspects of the business. He was a founder and former President and CEO of TSX-V listed GoldQuest Mining Corp. principally focused on exploration in the Dominican Republic. More recently, he was Vice President – Greenfields Exploration for Kinross Gold Corp. responsible for global greenfields exploration. Mr. Waddell brings with him excellent experience and a broad knowledge of Latin America including Peru where he lived and worked for over three years. Mr. Wagner is the former President and CEO of West Timmins Mining. Mr. Wagner and his team were instrumental in the discovery of the high-grade Thunder Creek Gold Zone in Timmins, Ontario and the subsequent acquisition of West Timmins by Lake Shore Gold in an all share deal valued at $424 million which was completed in November of 2009. Mr. Wagner now heads Balmoral Resources whose team has been twice recognized as the Explorers of the Year in Quebec for Balmoral’s Martiniere and Grasset discoveries. Mr. Wagner and the team at Platinum Group Metals were awarded the NWOPA Explorer of the Year Award in 2004 for the Seagull Pt-Pd discovery near Thunder Bay, Ontario. In addition to his duties with Balmoral, Mr. Wagner currently serves on the Board of Directors of Newcastle Gold and is a co-founder of Falco Resources. On March 1, 2019, Palamina Corp. announced that it has closed the first tranche of its non-brokered private placement offering announced on Jan. 31, 2019, and Feb. 8, 2019. In this first tranche, the Company raised a total of $1,535,500 for the issuance of 5,118,332 units at the price of 30 cents per unit. On February 8, 2019, Palamina Corp. announced that it has amended certain terms of its non-brokered private placement previously disclosed in a press release dated Jan. 31, 2019. Pursuant to the terms of the amended offering, the Company will conduct a non-brokered private placement offering of up to 7,333,333 units at a purchase price of 30 cents per unit, for aggregate gross proceeds of up to $2.2-million. On January 31, 2019, Palamina Corp. announced that it will conduct a non-brokered private placement offering of up to 6.25 million units at a purchase price of 32 cents per unit for aggregate gross proceeds of up to $2-million. On January 14, 2019, Palamina Corp. announced that it has submitted a Declaración de Impacto Ambiental (“DIA”) or Environmental Impact Declaration to the Peruvian Ministry of Energy and Mines for the Coasa Gold Project. The DIA is the primary environmental permit required prior to drilling. 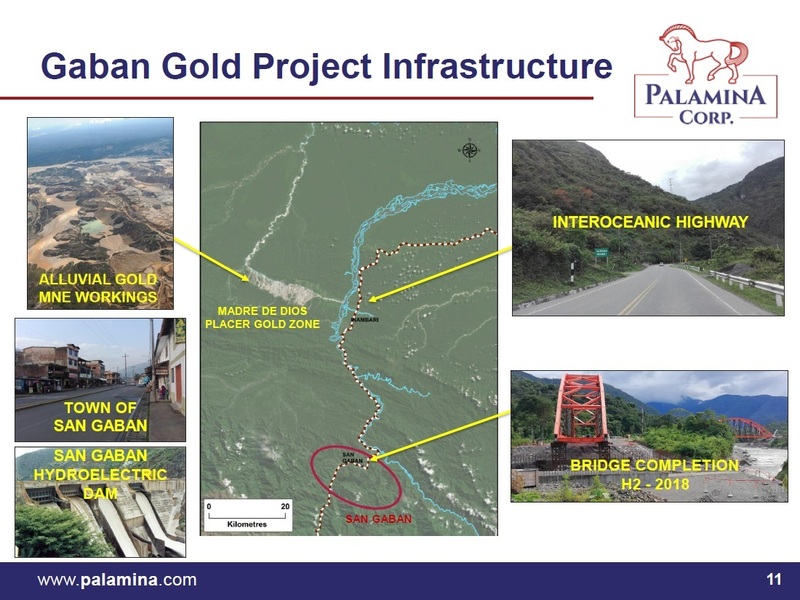 On January 8, 2019, Palamina Corp. announced that it has filed on SEDAR a technical report prepared in accordance with National Instrument 43-101 on the Coasa Gold Project in the Puno region of Peru. 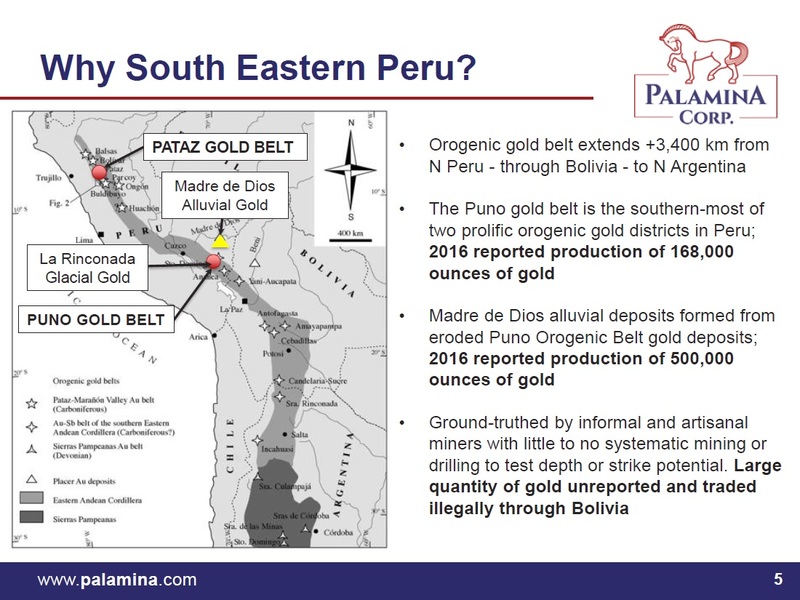 On December 11, 2018, Palamina Corp. announced that it has completed further channel sampling in the Veta zone at the Coasa gold project in southeastern Peru. The Veta zone continues to return high-grade gold mineralization highlighted by channel samples returning 123 grams per tonne gold over 1.0 metre, 26.3 grams per tonne gold over 1.7 metres, 18.3 grams per tonne gold over 1.7 metres, 17.4 grams per tonne gold over 1.4 metres and 13.5 grams per tonne gold over 2.0 metres. A completed DIA social environmental impact permit application is scheduled to be submitted to the Peruvian Ministry of Mines before the end of 2018. Granting of the DIA will allow for surface excavations, road making, trenching and drilling to be carried out over the Veta and Phusca zones. 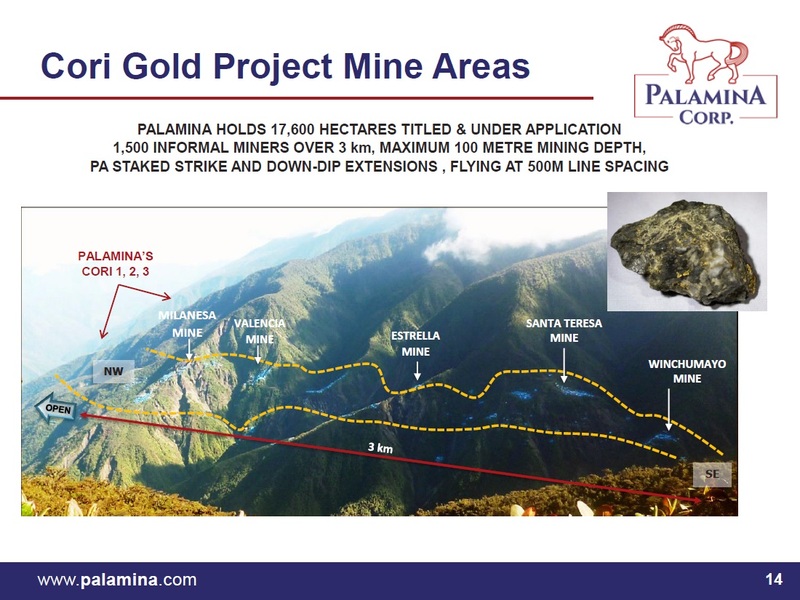 On October 29, 2018, Palamina Corp. announced that it has completed helicopter-borne geophysical surveys over its Coasa, Gaban and Cori gold projects in the Puno Orogenic gold belt (POGB) of Peru. Palamina is the first company to conduct heli-borne geophysics in the POGB. On October 4, 2018, Palamina Corp. reported 3 metres of 30.5 g/t Gold (sample no. 2639) from the Cayos Gold Zone at its Coasa gold project in southeastern Peru. This gold intersection from Cayos represents Palamina's best channel sample to date at Coasa. 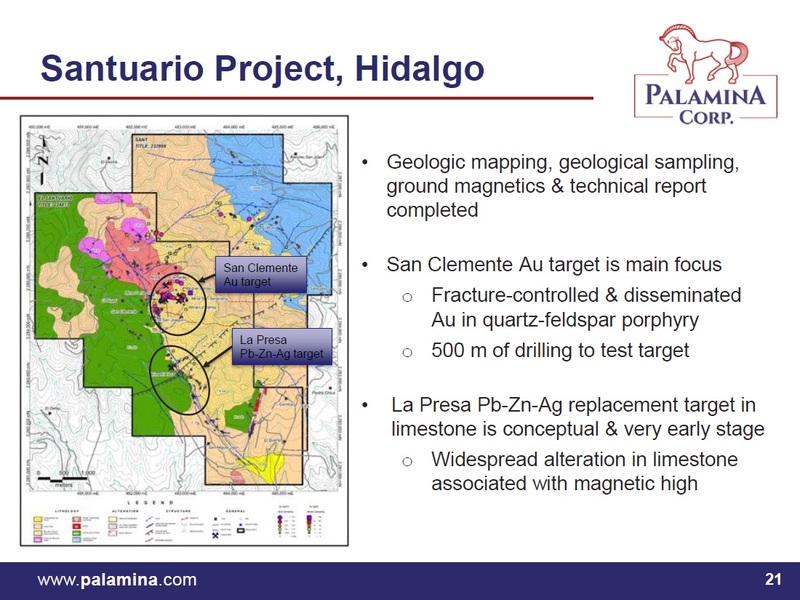 Palamina Corp. has conducted a reconnaissance sampling program in the recently defined Cayos gold zone at its Coasa gold project. 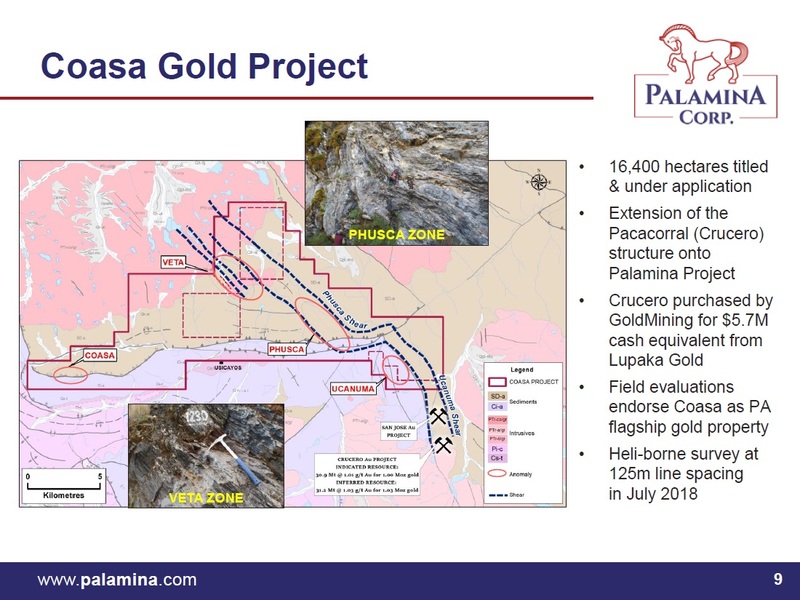 On August 21, 2018, Palamina Corp. announced that New-Sense Geophysics Ltd. has commenced a 3,083-line-kilometre heliborne geophysical survey over Palamina Corp.'s Coasa, Gaban and Cori gold projects in the Puno Orogenic gold belt (POGB) in southeastern Peru. On July 17, 2018, Palamina Corp. announced that it has completed further staking to increase its title and application mining exploration rights to 18,900 hectares at the Bendi gold project in the Puno orogenic gold belt (POGB) in southern Peru.